San Francisco is full of talk about Vermeer these days because a new exhibit at the DeYoung Museum is attracting crowds of people to see the famous Girl with a Pearl Earring and other paintings of the Dutch Golden Age. The Vermeer show seems to be attracting almost as many people as the Impressionists did recently. making lace. Well, all right, very few of us make lace these days, but most of us have handled a needle and thread if only to sew on a button. There is a fascinating book called Vermeer’s Hat by Timothy Brook published a couple of years ago, which is not a study of Vermeer’s paintings, but an introduction to his world. Starting with the hat Vermeer features in several of his pictures, Brook expands on the number of items that Vermeer shows us which give us clues to his world. At first glance the pictures show us what seems a mundane world of domestic comforts, but knowing the background of some of the items lets us see them as keys to a new world. The hat brings up the subject of beaver fur and how important the fur trade was in opening North America to trade with Europe. Who knew? The map on the wall in Vermeer’s rooms as well as his painting of The Geographer poring over a sheet on which he is presumably drawing a new map, shows us a world that was growing beyond the boundaries of Europe. 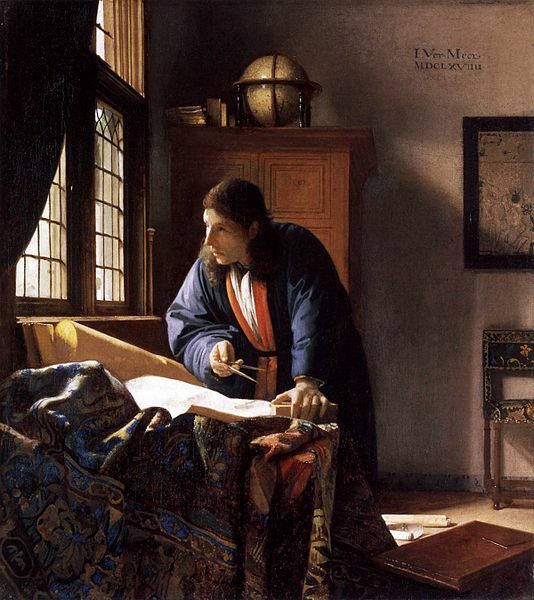 During the 1650s and 1660s when Vermeer was painting, scientists and explorers as well as merchants were finding that the world was much bigger and laden with greater treasures than they had dreamed of. The history behind Vermeer’s paintings expands our understanding of why they appeal to us so much. The people seem alive because their world was opening up to them and the more we know about and enjoy their world, the more we can understand the possibilities in ours. It’s a perfect example of how looking at the past informs our feelings about today.